The feature of each of the shots above to which I wish to draw attention is what appear to be Maple Leaf flags. They are all over downtown at the time the film was made, evidently. They were affixed to the rear end of the automobiles driving away from the camera; there was one draped over the hotel entry; and they were vertically oriented for display on street standards. The maple leaf illustrations are not the standardized/simplified versions to which Canadians have become accustomed to seeing on our national flag since it became such in 1965. Prime Minister Lester B. Pearson, the highest profile advocate for what became the Canadian flag, wanted the leaf to be readily drawn by children. The leaves on the flags that appear in the film are, perhaps, nearer in appearance to actual leaves of the maple. They bear an unfortunate resemblance, however, to the modern eye, to the leaf of the Cannabis plant. When was the film made? I’m inclined to believe it’s a 1927 film (CVA claims it was produced ca1926). There are a couple of things that led me to this conclusion: (1) 1927 was the diamond jubilee (60th year anniversary) of confederation; (2) the presence of at least one royal symbol – in the image of the car parked in front of the hotel (look at the top left corner at the banner with a crown) – would tie in well with 1927, as Edward, Prince of Wales, visited Vancouver that year. There is a CBC archive video here that touches on the national flag debate in 1964 and its controversial conclusion using the ‘closure’ tactic. CVA 160-26 – City Hall; New Flag – Spread Out 1965 William O. Banfield photo. VAIW note: Mayor William Rathie (1963-66) is pictured raising the national flag to the left of the image. ¹Tom Carter has pointed out that the exterior (and, I think, interior) shots were taken at the then-adjacent, now-demolished, Hotel Devonshire. This entry was posted in Illustrations, politics, Uncategorized and tagged bc, Canada, cannabis plant, coat of arms, devonshire hotel, flag, great flag debate, history, maple leaf, marijuana leaf, vancouver. Bookmark the permalink. 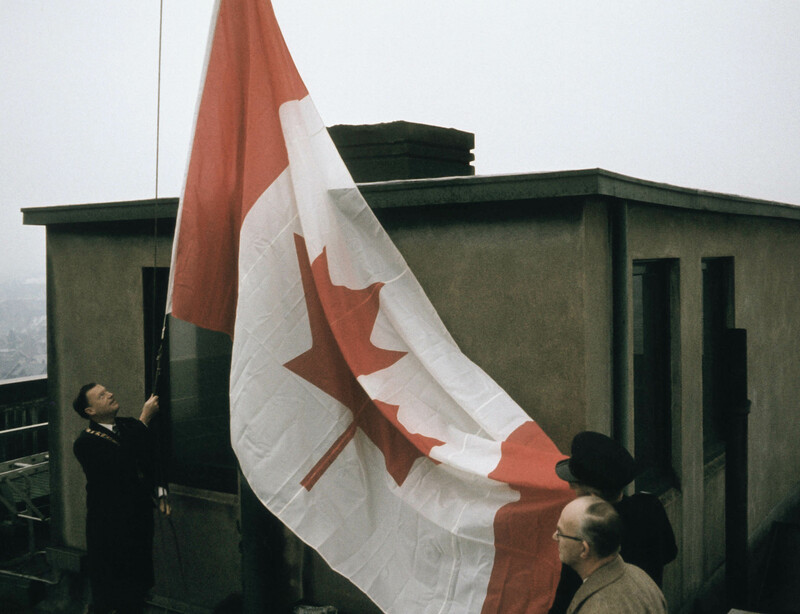 1 Response to Maple Leaf Flying in Vancouver Nearly 40 Years Before Becoming National Flag! Nice, my uncle John was the MP who saw the flag through the Commons in the 60s.